Nike Yoga Camps enters its second summer with a bang offering 13 locations across the U.S.
Our goal at Nike Yoga Camps is to intertwine the physical benefits of yoga for kids with the mindfulness of yoga to help kids, tweens, and teens improve their flexibility, performance, recovery and confidence. Under US Sports Camps, the official operators of Nike Sports Camps and America’s #1 sport camp network, Nike Yoga Camps breaks the stereotypical sports camp barrier offering competitive, athletic-based kids yoga training directed by some of the country’s top yoga instructors. Entering its second summer, Nike Yoga Camps will be offered in 13 locations across the U.S. in prominent areas including Chicago, Austin, and Santa Monica. 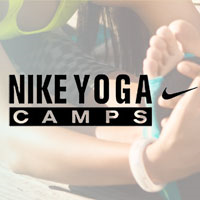 For more information on Nike Yoga Camps 2016 locations, instructors, dates, and more visit http://www.ussportscamps.com/yoga/ or call 1-800-NIKE-CAMP (645-3226).